The state of Minnesota and the Red Lake Band of Chippewa on Thursday continued an important partnership in the preservation of Minnesota�s premier walleye fisheries. The two signed a new five-year agreement, which included the U.S. Bureau of Indian Affairs, to jointly manage to maintain the health of the Upper and Lower Red Lakes fishery. Buy 1 Tanning Package - Get 1 Off!!! Register for 5 nights through 06/19/2010 and receive 25% off!! Save up to 30% Off In-Stock Gowns! Great selection of new and used inventory! Is your business facing the winds of change? Check out Health Careers at NTC!! Nextview all offers | sign up for email offers | add your businessThe state of Minnesota and the Red Lake Band of Chippewa on Thursday continued an important partnership in the preservation of Minnesota�s premier walleye fisheries. The two signed a new five-year agreement, which included the U.S. Bureau of Indian Affairs, to jointly manage to maintain the health of the Upper and Lower Red Lakes fishery. The fishery collapsed in the 1990s through overfishing, mostly by the band�s commercial fishing operation. The walleye has helped the Red Lake people sustain themselves for decades, and even aided domestic relief efforts during World War II. Aided by technical experts, the politicians made the right decision in 1999 to impose a moratorium on walleye fishing in both Red Lakes until the stock could be built up, both naturally and with millions of fingerlings from Lake Vermilion. 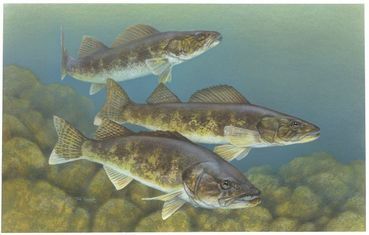 While admitting it might take10 years, the walleye fishery was reopened in 2006, only seven years due to a strong comeback. The cross-jurisdictional partnership worked, and the walleye recovered. About 75 percent of the lakes are tribal waters, and 25 percent regulated by the state of Minnesota. Both the state and the Red Lake Nation have set quotas to properly manage the resource to prevent it from collapsing again. The new memorandum of understanding closely parallels that initial 1999-2009 agreement, stating that each entity will support the Red Lake Fisheries Technical Committee, the joint panel of experts that recommends policies and practices to maintain the fishery. For Minnesota�s part, it is estimated that 1.1 million pounds of walleye have been harvested since Upper Red Lake was opened to fishing in 2006. The partnership is a model for resource recovery, involving a sovereign tribal nation, the United States and the state of Minnesota. And it has benefit the people of the Red Lake Reservation who now have restored a subsistence fishery, for creating economic development the Waskish area, and in protecting the future of the valuable walleye resource itself. Such efforts need to be lauded, and encouraged in other areas of mutual concern such as law enforcement and social services. MENU IS FUNNY TO ADD, BUT THANK YOU TERRY. I love reading GOOD news. TY Terry. this is great news Terry. Hmmm. sounds fishy to me, heh heh. There is one thing that could make things better for our depleted fish counts across the world. That is deploying this tactic everywhere, think 'sustainability'. Nice one Lone, interestings article from a fellow wolf, Howwwwwwlll!